As soon as the winds start to blow, the windsurfers generally gather at low tide with a prevailing south westerly to make the most of the incoming tide and fantastic windsurfing conditions. The perfect wind against tide combination makes it easy to sail upwind and provides a small swell for some bump and jump fun. Sailing between Osea Island and the shore provides mirror flat shallows for smooth gybing and epic freestyle manoeuvres. Times: Forecast 16mph+, Wind against tide conditions. Request to Join the Facebook Group ‘Marconi Windsurfing’ where the member post times & dates to meet based on the forecast along with general social networking. 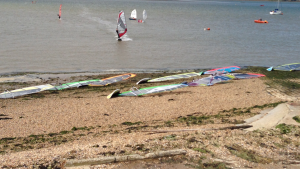 Our windsurfing members have a dedicated grassed Windsurf Rigging area with plenty of room for rigging and parking. The area is sheltered by surrounding trees and the clubhouse and is ideal for safely rigging and leaving your spare kit around for quick changes throughout the day. The area is very close to the water and even at low tide there is never a long walk with your kit. The club boast great changing and shower facilities, essential for those cold winter days as the member sail all year round. The galley is open for food on Sundays and several other selected days throughout the year and the Bar is open regularly. The Sailboard Rep, Nick Miller, also has access to the Bar should the members wish to have a well-deserved drink and social after sailing. Several of the windsurfing members are trained and have access to a safety boat for support if an individual gets into trouble. It is recommended that before going sailing there is at least 3 people sailing, 1 of which is trained and has access to the Safety boat for emergencies. Training can also be made available through the club, contact your rep for details. Marconi has a strong tide running which does not make it an ideal location for beginners. It does however make it ideal for improvers up to experts. The wind against tide conditions not only make it easy to get up wind and safe to go for some long broad reaching speed sailing, in windier conditions it provides a steep chop which is perfect for some bump & jump fun. Generally, the members gather just before low tide with a SW or W wind direction forecast. There is a half mile strip between Osea Island & the shore of which provides mirror flat water over the shallows on either side for smooth gybes and other creative moves whilst there is a small steep chop that builds in the middle of the river for some airtime. Again gathering at low tide, the NW direction allows for some long blasting conditions across the full mile width of the river. Over the far side of the river there is a huge shallow area which is ideal for practicing any manoeuvre in flat water whilst only falling into waist deep water when it goes wrong. 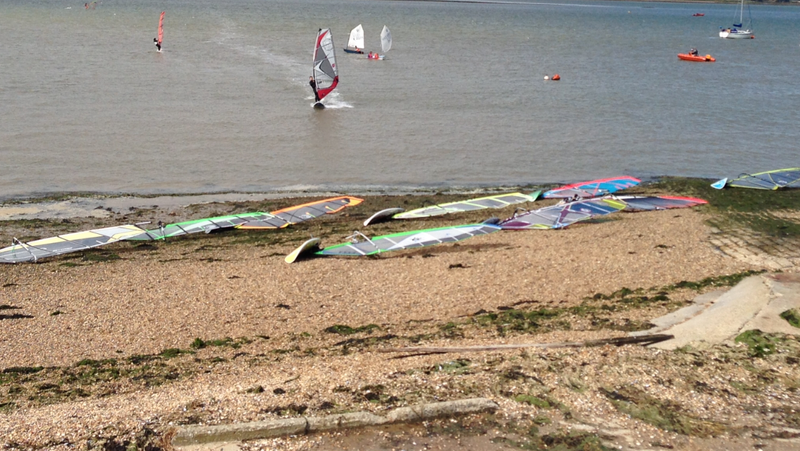 Generally at low tide, members usually sail over the top of Osea island’s spit. Choppy in the middle and flat in the shallows provides conditions for all. Strong Easterly’s provide the larger seas for those looking for some bigger jumps. Gathering just after high tide for a full day is sailing before the tide turns and conditions flatten. Marconi is situated on the corner of a large bay that enables you to sail in great conditions even when the wind is blowing offshore. Southerly winds are usually great for some big kit blasting, offering several mile long runs to Maldon and back. Several of our members are retired or self-employed meaning that we often have people out sailing whenever the wind is blowing during both the weekdays and weekends. 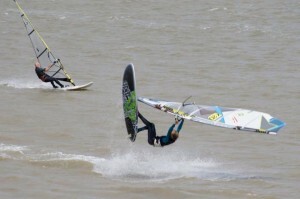 Managed by the windsurf representative, Nick Miller, the club offers free use of beginner windsurfing kit to its members. With boards ranging from 150ltrs – 180ltrs and sail sizes between 2.0m2 & 5.0m2, the equipment is perfect for your very first outing or for brushing up on some key skills. The kit is often set up to encourage use by its members on camping weekends. If you wish to book a specific day or time, please contact Nick on 07835 208010 who will run through the ideal conditions and safety considerations.